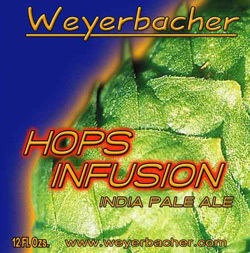 "Hops Infusion is loaded with piney, citrusy notes, much hops complexity, and a strong foundation of malt underneath it all.. Glowing a deep amber color, Hops Infusion is brewed with seven types of hops. Simcoe, Magnum, Cascade, Liberty, Saaz, Fuggles and E. Kent Goldings give this beer the complexity that's so interesting. Our brewers intention on Hops Infusion was to create a complexity of hops flavor and aromas, not found in any other beer. Pours a light amber color with a large off-white head with a nice healthy froth that gives some nice retention. Body has high clarity. Aroma is hops hops and hops, with some sweet citrus scent as well some floral/spruce/pine notes. Pleasant, not overpowering hop presence and some supportive malt backbone. Very inviting aroma. Initial taste is harshly bitter with some delicious hop character, retreating a bit at the end despite the solid hoppiness hanging around. Light to medium bodied, it\'s got a creamy texture with a dry, lip smacking mouthfeel from the hops and soft but active carbonation.